File this one under “I thought you knew that already.” Joe Danger, an arcade style game coming out soon for PSN, is now on the horizon for the PC as well. Evidently the word was that it would be PS3 exclusive. Well, we talked to the guys behind Joe Danger back at PAX East, and the guy running the demo indicated they were targeting PSN, PC, and XBLA from the start. It was just an issue of priorities. When you have a small dev team you have to focus on one thing at a time, and PSN was first. I guess I haven’t gotten used to the idea that I might be getting scoops when I talk to people. I heard about the PC discovery via Blues News. Now is as good a time as any to let you know what we thought of the game, then. Visually the game has a very exaggerated, caricature feel. You play as the stereotypical jumpsuit wearing daredevil. The most direct comparison you are inclined to make is a combination of Excite Bike and Trials HD, but there is a bit more to it than that. First of all, the game isn’t nearly the motocross physics simulator that Trials was. You have a far greater degree of control over your character. 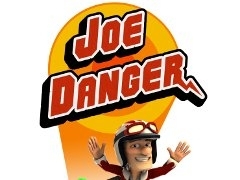 While in Trials you could “jump” if you waggled the controls and juiced the throttle just right, but in Joe Danger ducking and then releasing gives you an actual hop. You also have the same level of aerial control as a platform hero, with the ability to change direction in mid air. Couple that with the presence of a rechargeable boost tank for instant acceleration, collectible tokens, and pinball style springs that launch you into the air and there is a pronounced Sonic the Hedgehog influence as well. Adding to the list of games that this title borrows from, your various stunts and death-defying maneuvers string together into combos. The longer you can keep a combo going, the more points you accumulate. The mechanic will be familiar to fans of the earlier Tony Hawk games, with the wheelie taking the place of the manual. It is important to note that while the influence of other games was clear, at no point did this game feel like it was ripping anything off. Everything worked together very well, more of a seamless whole than a collection of borrowed concepts. We experienced what was likely to be Trophy support first hand, as our own Phawx was able to, after only a few rounds of tutorial, to complete an entire track in one massive combo. Once his score was tabulated, the indicated award was listed on the screen. And just to hammer home the multiplatform aim, the version of the game we played was running on a PC and the controller was from an XBOX 360. The other demo was set up on a PS3, so that just about covers it. All in all the game came off as a very solid, enjoyable title, a perfect fit for PSN and XBLA. The release date is tentatively Spring 2010, and you can learn more about it at Hello Games.